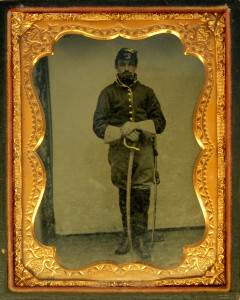 Augustus M. Davis (1837-1925) served in the 1st Massachusetts Cavalry. After the war, he married Rhoda Parkhurst of Tewkbury, where he worked as a farmer and a painter. The couple moved to Andover in 1886 and lived in the historic house now numbered 67 Salem Street. Davis died in 1925.